To recap my experience with the SCUD B, back in 1976 I scratchbuilt a model of the Soviet SS-1c SCUD B missile system. It was not very good as I had no idea of the accurate dimensions of the vehicle and its components. I was disappointed with the results. I recently relooked the DML SCUD B kit from 1992 with an ulterior motive: I knew I was getting the new Trumpeter kit for Christmas and wanted a base line to compare them. The Trumpeter kit arrived today and is a very impressive model by any standard. It has nearly 1,100 parts down to and including bolt-head level details, a nearly complete interior, and a really nice set of tires. The kit comes with three sheets of etched brass (only 104 parts as some are reasonably large) and two full decal sheets. One covers the interior and the other covers the missile and exterior of the launcher. Originally Trumpeter had announced this kit as the “SCUD C” and all of the sprues in the kit are so labeled; however their error was pointed out to them and the nomenclature on the box is correct. A “SCUD C” was what was known in the West as the KY-3 SCUD; KY for Kapustin Yar test range where it was first seen and 3 as it was the third unidentified missile tested there. It was later found to be about eight feet longer than a SCUD B and have a range of 450-500 kilometers (tops for a SCUD B is about 300 or a bit more). The launchers had the brush guard removed (the tubular part of Part M15 in the kit) to permit it to extend past the front of the vehicle. Few were ever noted and none seen in the forward area. The missile is actually called the 8K14 by the old Soviet GRAU system but in some sources was also known as the R-17. 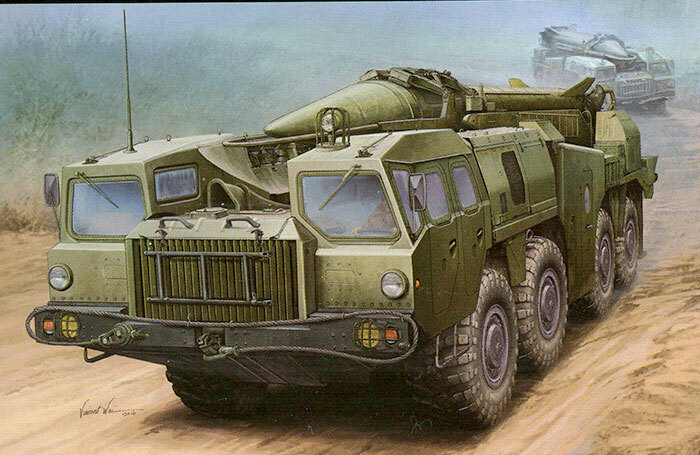 The launcher (transporter/erector/launcher or TEL) is a 9P117M1, the third and last launcher variant made by the Soviets using the MAZ-543 8 x 8 truck. The big external differences are only a single porthole on each side of the missile control module and a different radiator fitting on the left side behind the driver’s cab. The system is called 9K72 with the nickname “Ehl’brus” (Mount Elbrus) in Russian, but the popular nickname from the crews was “Kashalot” or sperm whale for its size and humped profile. The model comes with a large number of semi- or actual operating features. The missile may be elevated and rotated on its launcher base, the travel locks may be operated, jacks retract and lower, bins and the control module can be shown open or closed, the cabs elevate for access to the engine and the doors to the cabs may be operated with care. Oddly enough the elevation and transport positions call for the modeler to swap the pistons around – parts F45 and F47 for transport, F46 and A10 for erected. With care the side panels of the service module (parts J36 and J37) can be cut apart and posed open to show the extensive interior detailing (they are held up with struts and droop about 10 degrees when fully open). The third thing is very odd. While giving so many details to the model Trumpeter chose to leave out the extensive wiring and cabling at the rear of the launcher. There are ten cables that connect the missile to the launcher and all ten are missing. For reasons best known to themselves, Trumpeter left out the wiring BUT included a length of black insulated wire to make them! That one puzzles me. The kit comes with a nice 36 step booklet that covers the building of the model and gives a nice logical layout to the kit. It starts with the backbone chassis and its innards (transfer case and power takeoff to all eight wheels, then the accessories such as the compressed air system, and on to the twin torsion bar suspension (alas, none of this is visible when the model is completed!) The engine has 63 parts alone and also comes with the fuel injection system molded as a single part (part P23) and a pair of slide molded open exhaust pipes. The cabs have a nice level of detailing down to the “star” horn button on the steering wheel (part E27) for the driver and an R-123 radio and accessories for the commander (right front seat). Note that for anyone wanting to do a crew for the launcher it consists of one lieutenant, two warrant officers (praporshchiki), two sergeants, and two enlisted men. The driver is a sergeant, the commander the lieutenant, and the two warrant officers are responsible for preparing and aiming the missile. The other sergeant ensures the enlisted men carry out the manual operations. The decals cover a wealth of detail inside the cabins such as the instrument panel and the missile status boards and also the markings on the missile. These are quite extensive and while there are different levels of marking Trumpeter has provided a pretty good selection including the fin markers (I/II/III/IV with I being the lower left hand one when viewed from behind) and the various ports and markers on the missile airframe plus its “sling points” (twin stripes on either side of the airframe located for different loads and configurations of lifting with a crane). Note that the decals list the missile as an 8K14UT - practice training missile like that found at the IWM Duxford. Finishing directions cover no less than seven different nationalities: Afghanistan (2005), Armenia, Lybia (2011), Russia, Iraq (1991), Iraq (1980-1988), and Iran (1980-1988). Paint schemes are pegged to either Gunze Sangyo or the new AMMO line from MIG. Supplementary numbers are provided for some Testors Model Master, Tamiya and Humbrol colors. Note that the interior color of the cabs is a light seafoam green, not light blue as noted in the directions. Also the rear cabins tend to be orange with perhaps a darker shade used on the open doors. Surprisingly none of the Soviet or Warsaw Pact TELs are covered in this kit, which is a shame as there are many more photos of them in service than the ones given in the kit. Overall this is a magnificent kit other than the stumble with the cabling. But it is a daunting piece to work on with parts down to 0.5mm in size and anyone just wanting to build a SCUD kit may consider the DML one. It is not too bad and for $100 less with one-third the parts may be a worthwhile choice. Thanks to Wes and Kevin at Hobby Works Bel Air (MD) for helping me obtain the kit!.